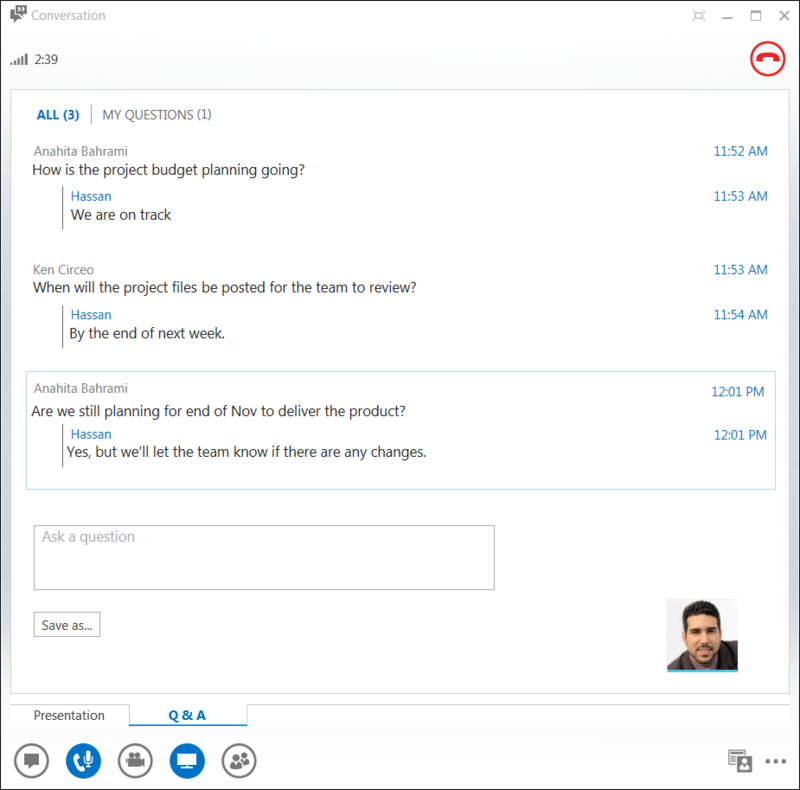 Lync Q&A Manager (question and answer) provides a structured environment for answering questions during a meeting. This feature is especially helpful in large meetings where a presenter can answer questions, while someone else is presenting meeting content. Keep in mind that attendees can ask questions, but only presenters can answer. Any of the presenters in a meeting can start the Q&A Manager and reply to questions. If you are attending a meeting see Use the Q&A Manager as a participant. 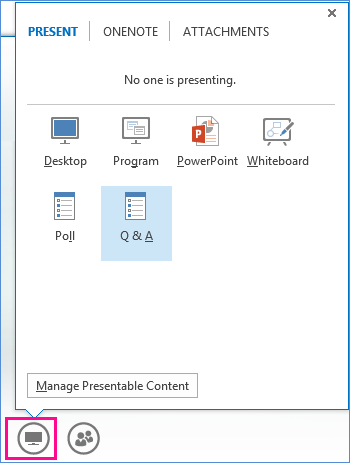 In your Lync Meeting, point to the presentation (monitor) icon, then click Q&A. If there are no other content presented, the content stage opens and displays the Q&A manager for all participants. If other content is active, the Q&A tab displays as a new tab next to the Presentation tab. 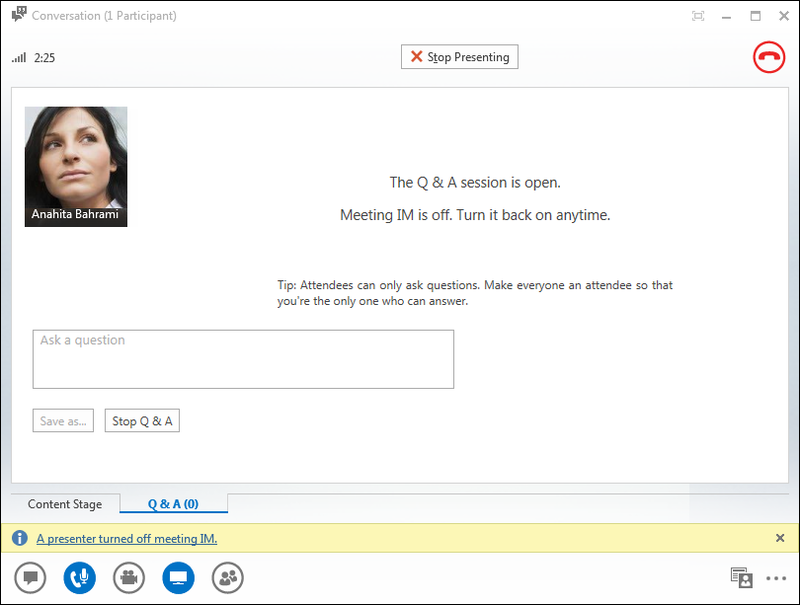 The Meeting IM is automatically turned off until you stop the Q&A Manager. When a question is submitted, any of the presenters can click Answer and type a reply. Then press Enter on the keyboard to post the answer. If you’re presenting content when a question is submitted, you’ll see a notification about the new question. You can click the Q&A tab at any time to answer the question, and then go back to Presentation tab to continue your presentation. If you start typing an answer and change your mind, click Cancel to answer later, or for another presenter to pick up the question. Click the Unanswered tab to filter for the questions that haven’t been answered yet. At the end of the session, click Stop Q&A. When Lync asks if you want to enable IM, click Allow All Meeting IM, or click X on the notification if you want to keep the IM off. If you want a record of the Q&A session, click Save As, type a name and save the file on your computer. Q&A is saved in Notepad and contains the questions, answers, time stamps and the names of attendees and presenters who participated. When the Q&A session is shared by a presenter, all the meeting attendees can view and ask questions. Keep in mind that you can switch between the Q&A and Presentation tabs at any time during the meeting. Type a question in the Ask a question box. When the question is answered, you’ll see the response below your question. If you only want to see your questions, click the My Questions tab. To have a local copy of the questions and Answers, click Save as…, and select a location on your computer.